The Hutch Club is a new pop-up cellar jazz and cocktail bar underneath Quaglino's in Mayfair, offering an art deco inspired Martini bar, a private Drinking Den, and an alcoholic popcorn bar. Entry is by reservation only - see details at the bottom for how to book. 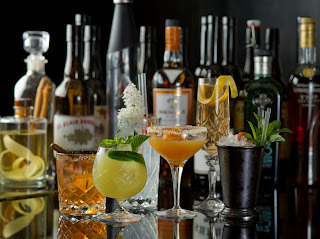 "This summer sees the launch of THE HUTCH CLUB at QUAGLINO’S in Mayfair (www.quaglinos-restaurant.co.uk/the-hutch-club): a glamorous cocktail and jazz pop up bar which plays homage to the venue’s hedonistic spirit, which began when flamboyant host Giovanni Quaglino opened the doors to a beautiful, decadent society crowd in 1929. THE HUTCH CLUB at QUAGLINO’S will be located in the depths of the iconic London venue from 1st June 2013 – 31st August 2013 and will boast an Art Deco inspired Martini Bar, a private Drinking Den and London’s first boutique alcoholic Popcorn Bar. The late-night revelry and charm of evenings with Hutch will be revived with a programme of live jazz on Friday and Saturday evenings, featuring the Basin Street Brawlers who will bring to life the hottest stomps and rag tunes from the roaring 1920's. Other acts include vintage vocal duo Verity & Violet; Benoit Viellefon and His Hot Club playing the feverish swinging music that emerged from the infamous Parisian Cafes of that era and The Dixie Ticklers, playing Dixieland jazz with a contemporary London edge. The Hutch Club will feature London’s first boutique alcoholic Popcorn Bar curated by gourmet popcorn connoisseurs Joe & Seph, who have designed an exclusive Gin & Tonic flavour with No 3 London Dry Gin for the club, among other alcoholic varieties to be paired with artfully crafted cocktails."